In addition to the locomotive and the two passenger wagons, the 7740 Inter-City Passenger Train set included an oval track (which I won’t fully build) and a small station platform (which I will build). 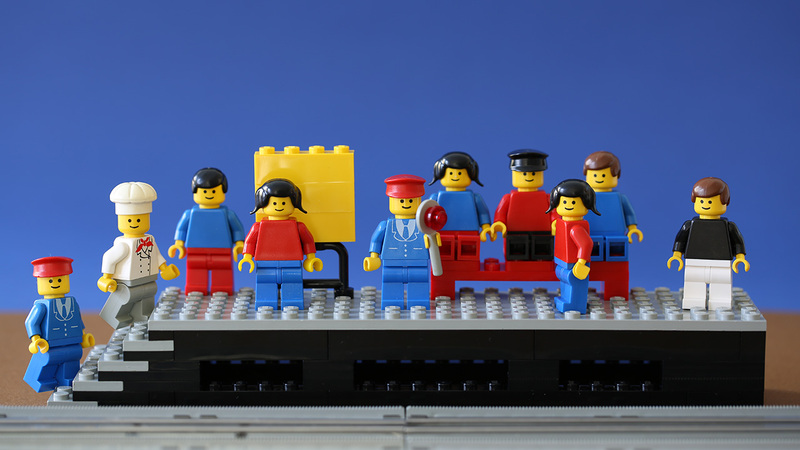 Although the platform was originally built last in the building instructions, I thought it would be fitting to set it up with some of the minifigures to “wait for the train” to literally arrive. The funny thing is, the opening lines of this blog post Waiting for train were originally written in August 2012, over one year ago. I had began preparing the post certain that with my new brick acquisitions and the old grey heavy previous project, I would be able to furnish all the parts for the station platform and some minifigures far before I could start building the train. Well, reality turned out to be that I would have been able to complete the entire platform using my Pick a Brick order and a few old grey 2×6 plates from my childhood collection… if it hadn’t been for that pesky 6×24 old grey plate. It would be around one year later that I finally managed to get that plate ordered and delivered (not that it was hard, I just didn’t get it done). 7740 Inter-City Passenger Train had an impressive 10 minifigures included (three staff and seven passengers), all of which I have been able to build here, as all the passengers use very generic parts. The minifigures are mostly from my childhood collection, the train conductors from the 7710 Push-Along Passenger Steam Train and the 7835 Road Crossing and the chef probably from the 675 Snack bar. The rest I built from a combination of other old spares and the few new parts I was able to acquire from the Billund LEGO Shop and from other new set purchases. I found getting new pants was pretty easy, so all of them (except the old grey chef pants) are new, as are a few headgears – all the torsos are old, it is surprisingly hard to find plain minifigure torsos these days. P.S. Originally the station platform included a STAMP sticker for the timetable. I have been hinted a source, but for this project I will leave it as is.